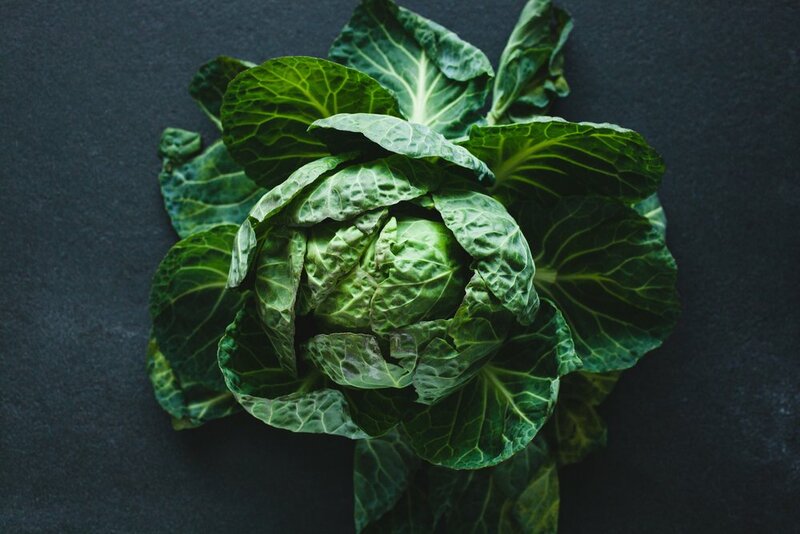 Brussels sprouts are a cruciferous vegetable, meaning they are in the Brassicaceae family which includes cabbage, broccoli, collard greens and kale and are packed with nutrition. Brussels sprouts are considered a great disease-fighting food, helping to fight against cancer, diabetes, and heart disease. Nutrition: Low in calories and rich in anti-oxidants, potassium, and high amounts of Vitamin K & C. They are also good sources for your daily requirements of dietary fiber, Vitamin A, manganese, potassium, folate, iron and Vitamin B6. So, basically, they're like Nature's tasty multi-vitamin. Season: Harvest season is between September and March in temperate climates. Sprouts and leaves become sweeter after a frost. Brussels sprouts in all forms are covering restaurant menus and Pinterest pages these days, but often overlooked are the large leaves that shelter the tiny sprouts as they grow (if you're unfamiliar with how Brussels sprouts grow, check this out). The leaves are edible and just as tasty as the sprouts. They aren't typically found in conventional grocery stores, but they are popping up around farmers markets or you may have them in your own garden. The leaves can be used in the same ways as kale, cabbage or collard greens by sautéing, shredding into salads or adding to green smoothies. But what you may be even less familiar with or just walked by dismissing it as cabbage, is the top of the Brussels sprouts stalk. As the stalk grows, the leaves form a head at the top, much like a very loose head of cabbage or one giant Brussels sprout. I love the small sprouts, but I definitely think the head of leaves is where the magic is. To me, the best roasted sprouts are when the outer leaves get crispy but the inner core is tender and sweet. 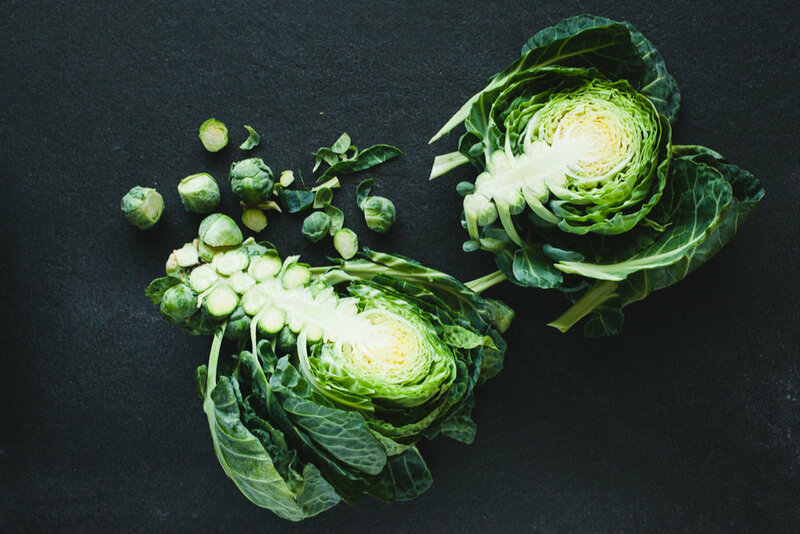 The head of Brussels sprout leaves create that partnership perfectly. If you are growing your own Brussels sprouts or find the heads locally, try this method of roasting and treating it like one giant Brussels sprout. The recipe below is just a baseline for roasting; how you choose the finish the roasted leaves us totally up to you! I used a bunch of fresh herbs I had leftover in the fridge to make a pesto, drizzled with extra vinegar, some shaved parmesan and additional fresh herbs. This is a great way to use up leftover condiments, herbs, sauces and cheeses that you have sitting around. If you can't find the heads of leaves, a napa, savoy or red cabbage will substitute nicely. Cut your head of Brussels sprout leaves or cabbage in half, from the top of the head to the stem end. Place each half cut side up on a lined baking sheet. In a small bowl, mix together vinegar, sugar, salt and olive oil. Pour a quarter or so of the mixture over the cut side of each half, allowing the liquid to seep in between the layers of leaves. Flip them over, cut-side down and lift any outer loose leaves, brushing the inner leaves with the mixture and all over the outside of each half. If you have any remaining vinegar, set aside for later use. Place the sheet pan in the oven and roast for 20-30 minutes, or until the middle is tender and the outer leaves become brown and crispy. You do not want them to burn. Remove from the oven and serve with garnishes of your choice. I drizzled mine with the remaining vinegar, herb pesto, fresh mint and dill leaves, and shaved parmesan cheese.